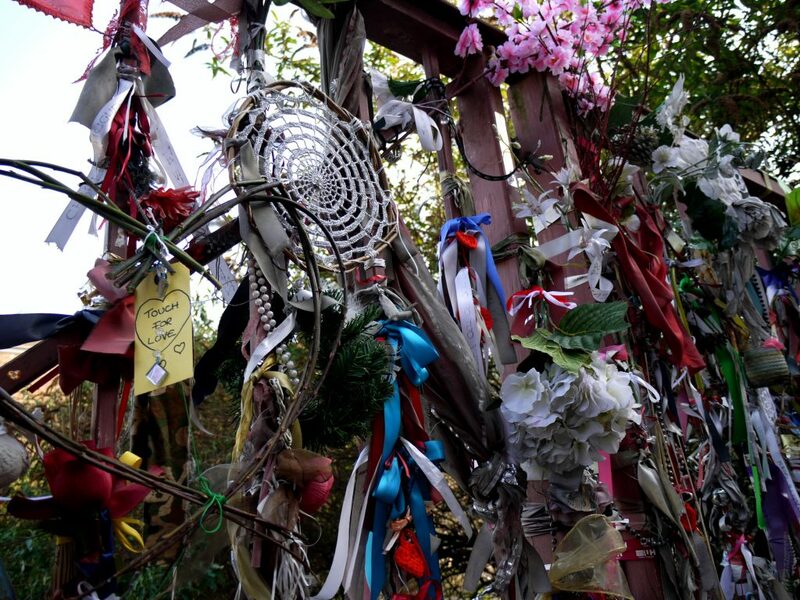 At 6.45pm we gather at Crossbones Graveyard – in the street at the shrine in Redcross Way SE1. The Vigil begins on the stroke of 7pm. This will be the 178th successive Vigil, held at this time, on this day, every month since June 2004! We perform our time-honoured rituals to renew the shrine, to remember the outcast, dead and alive, and to relive the secret history as revealed by The Goose to John Crow. We light the open pathways, hang our hopes and dreams in ribbons tied to the gate, and close with our unconditional blessings. At the heart of the Vigil, there’s space for those who wish to share a poem, song or brief personal testimony connected with Crossbones and “outsiders” of all kinds. This month marks the Spring Equinox when we balance the darkness of the Crossbones story with the new light rising there. It’s also the portal to the first anniversary of Katy and John’s wedding and celebration of friendship, which was attended by many Friends of Crossbones. For this months “Jules’ spot”, our resident speaker Jules will read out poems and well-wishings by John Cooper Clarke and Jo Brand, which Jules had solicited but which, in the happy chaos of the day, remained unread. You are invited to bring your own memento, totemic object or ribbon to tie to the gate. For those who forget, ribbons may be provided – though creating your own offering deepens your experience of The Goose and her grace. Please also be ready to serve a few minutes as a Goose Samurai, helping close the road to keep us all alive. This is the highest honour that any participant can receive, and enables us all to experience the many facets of the Crossbones Vigil.